The CEO of one of the largest cryptocurrency exchanges in Canada, QuadrigaCX, has decreased in December 2018. The high-profile death of Geral Cotten resulted in the loss of about $190 million worth of digital currencies that were held in the exchange’s cold wallets Cotten had exclusive access to. As mentioned before, Cotten had exclusive access to all the funds that have been stored in the Quadriga cold wallets. The wife of the deceased Quadriga CEO – who is the inheritor of all the property of Cotten – has confirmed this by stating that she has hired a cybersecurity expert to breach the computer of the CEO. According to the statement, Cotten’s computer remains heavily encrypted with no significant discovery in the case. The lost funds accounted for 26,500 Bitcoin (BTC), 11,000 Bitcoin Cash (BCH), 11,000 Bitcoin SV (BSV), 430,000 Ether (ETH), 200,000 Litecoin (LTC) as well as 25,000 Bitcoin Gold (BTG). The funds on the cold wallets are worth approximately $190 million. As the remaining operators of the Canadian cryptocurrency exchange are unable to access the funds held in the cold wallets, the whole case adds up to a massive scandal that leaves numerous customers angry. An unfortunate death or a well-planned exit scam? At first glance, the death of the Quadriga CEO seems very unfortunate. However, there are plenty of factors that make us question whether Cotten has died for real. Let’s see them. Firstly, Cotten has allegedly passed away on December 9, 2018, due to complications arising from Crohn’s disease. Passed away at the age of 30, both a statement of death and a death certificate have been issued by a Halifax funeral home and the Government of Rajasthan’s Directorate of Economics and Statistics respectively. According to the latter, Cotten had died in Jaipur, India. Cotten’s Death Statement. Is it real? India has been known as a country where the government is struggling with maintaining order regarding documentation. Also, it is possible to fabricate marriage, birth, and most importantly death certificates in some parts of the Asian country. To obtain a death certificate in Jaipur, one has to fill out an application form as well as providing a fee receipt and an international passport (in case of non-Indian citizens). Therefore, it seems possible to obtain a fake death certificate by bribing an official or by improper confirmation. A Reddit user has already requested proof of death both from the operators of Quadriga and the wife of the deceased CEO. The second suspicious issue in the case is Cotten’s will that had been set up about two weeks before the CEO’s death. 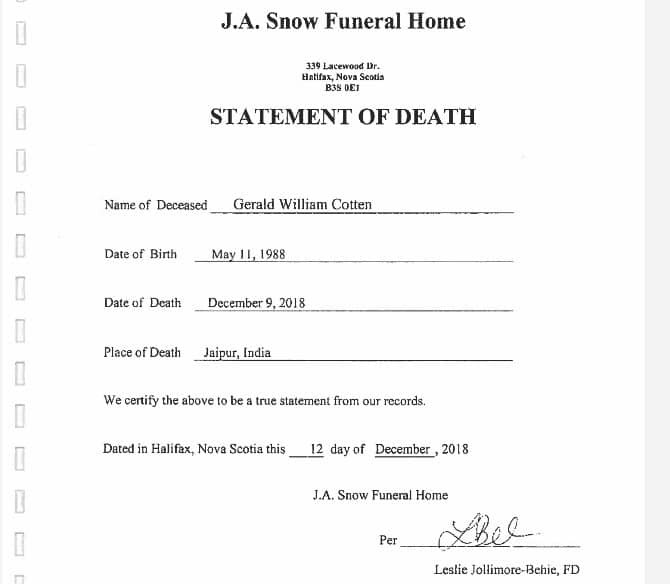 Signed on November 27, 2018, it is stated in the will that Cotten’s wife, Jennifer Robertson, would receive all the assets of the Quadriga CEO in case of his death. What’s weird about Cotten’s will is that he was very thorough when it came to providing his family, but not the company he was the CEO of. Cotten even set a plan to care for his dogs, but he refused to include QuadrigaCX in his will where he had exclusive access to $190 million worth of funds. As mentioned before, approximately 200,000 LTC were held in the cold wallets where Cotten had exclusive access to. CryptoPotato has reported that despite the operators of the exchange claimed they had no access to the funds above; a blockchain analysis has shown that the Litecoins were moved away from the cold wallets after Cotten’s death. Furthermore, according to the founder and CEO of the web crypto wallet MyCrypto, Taylor Monahan, QuadrigaCX has no Ether cold wallets despite claiming that approximately 430,000 ETHs were ‘stuck’ after Cotten’s death. Reacting to Monahan’s findings, Kraken CEO Jesse Powell stated that his team is investigating the case of Quadriga’s missing funds. Powell suggested law enforcement authorities to contact his company for more information. Furthermore, a Zero nonsense investigation has connected the case with money laundering. Also, CryptoPotato has reported on rumors claiming that the real identity of Michael Patryn, the co-founder of QuadrigaCX, is Omar Dhanani who has pleaded guilty in 2005 along with five others for committing credit card and identity fraud as part of the ShadowCrew criminal organization. Only time will solve the mystery called QuadrigaCX. Until then, the users of the exchange are suffering and have no idea if and when they will see their funds again. The post The $190 Million Dollar Question: The Known & Unknown About QuadrigaCX Exchange Mystery appeared first on CryptoPotato.